An attempt at an R&B/soul recording, 12-Bar Original was The Beatles' first instrumental since the group signed to EMI in 1962. 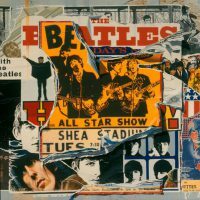 Although recorded in 1965, it wasn't released until 1996, when an edited version was included on Anthology 2. The full uncut version is over six minutes long. A writing collaboration between all four members of The Beatles, the seemingly improvised 12-Bar Original was recorded during the sessions for Rubber Soul. It is possible that it was recorded in case they were unable to come up with the required 14 songs. A rather dull and uneventful 12-bar blues workout featuring George Martin on harmonium, the tune was The Beatles' attempt at a blues recording loosely based on Booker T and the MGs' 1962 hit Green Onions. However, the group seemed unable to instill much panache in the recording; the tune fails to ignite and remains plodding for much of its duration. It was likely never seriously considered for release during The Beatles' career. The Beatles were aware of the influence of the blues and soul on mid-60s groups such as The Yardbirds and The Animals. 'Plastic soul' was a phrase spoken several times by Paul McCartney during the June 1965 session for I'm Down. He explained to the rest of the group that it was a term used by black musicians to describe Mick Jagger. If 'Rubber soul' was The Beatles' take on it, 12-Bar Original could be seen as a manifestation of that type of music. After The Beatles' split, it was rumoured that Rubber Soul was originally intended to have an instrumental title track – it could well be that 12-Bar Original was that piece. John Lennon and Ringo Starr were the only Beatles to comment publicly on the tune. In a US radio interview, Lennon was asked if there were any unissued Beatles recordings, and replied that he recalled just "some lousy 12 bar". Starr told a journalist that "We all wrote the track and I have an acetate of one of the versions". 12-Bar Original was recorded in the early hours of 4 November 1965, after The Beatles had recorded What Goes On. They first rehearsed the tune, then wiped the recording of it with two takes. The first broke down, but the second lasted 6'42". An edit of this, lasting 2'55", was eventually released in 1996 on Anthology 2. A mono mix of 12-Bar Original was made on 30 November 1965, just three days before the UK release of Rubber Soul, and far too late for inclusion. Acetate discs of the mix were then cut for The Beatles' private collections. the funny thing is, the song “How Many More Times” by Led Zeppelin has a riff remarkably similar to the riff in this song. I personally think its a good song despite it being rather repetitive. lol. fun song just to chill to. Interesting as an anomaly in their catalog, and maybe their first brush with guitar near-distortion. It’s nice to know this exists, and that they could attempt this sort of thing if they wanted, but it’s really not great – other Brit bands of the time (not to mention the MGs themselves) were doing similar stuff better. Worst aspect: George Martin’s harmonium, unworthy of his usually valuable keyboard contributions. I love it for all the reasons Vonbontee cites above. Not the greatest 12 bar blues in history, but it shows that they were capable of that as well as everything else they had done and would do. I wish they had experimented more in this vein. A Strange, Crazy and Unique song. Not great but fine. It’s not really that wild, being literally 12 bar blues. Wouldn’t that have just been killer if the Beatles had stayed together in the 70’s and heard some of the grooves that George Clinton was putting down? Imagine the Beatles version of Give Up the Funk. Actually the Harmonium was muted on the Anthology 2 version. The only Harmonium in it is bleed through from the other instruments. It can be haerd in all it’s “glory” on the full 6-minute take. Quite rightly left in the can at the time. Interesting to listen to once or twice, but far below the caliber of other songs being cut for Rubber Soul at the time. Might have been ok for an average rock & roll band of the day, but The Beatles were not your average band. Maybe the Stones could’ve used it as a sequel to “Now I’ve Got A Witness”. Well, I thought that was humorous. This is an absolutely generic 12-bar of the type knocked out by every budding group in the country as a warm up. There is nothing exceptional about it apart from the fact that it is outside The Beatles’ comfort zone, and this fact is absolutely clear from the lacklustre performance captured on tape. Having you said that… I still find this “warm up” more enjoyable to listen to than most rock sounds that have been sweated over, polished up and released. Excellent musicianship does not really make the song, but composition does. That is why great bands can have a lousy song on their album, if the composition or melody is junk. Not too often if ever the case with the Beatles. Their compositions continue to amaze. I really do like this song, because it has a pleasant sound. 12-Bar Original is by far the most boring Beatles track short of the original lead guitar solo on Yer Blues (to hear it, grab your copy of the White Album, and when the solo come on at the end, pan your balance knob (or slider) to hear only the left channel. Not exactly the tune you remember, is it? But then, you’ve got to admire how George Martin was able to fix it! quite like “12-bar original” a cool wee instrumental, from what i’ve read it was an emergency standby for “rubber soul” if they didn’t have enough tracks. Unfortunately harrison is no steve cropper but you can’t have everything. I’m listening to the full version now and that’s some fine lead guitar tone. Anybody know what guitar and amp? I’m gonna guess casino in an ac100? Sounds a little throaty to be a strat. It’s got that plunka plunka sound of a casino with dead or flat strings. CCR? Maybe in their Blue Velvet days (pre Golliwogs, which is pre Creedence). I think George plays a stratocaster and John his Epiphone. combo organ, probably the Vox Continental that John Lennon used in live performances in 1965/66, also used on I’m Down. However, The Beatles did ues the harmonium on other songs like We Can Work it Out, Cry Baby Cry, Rocky Raccoon, etc.